Rustic Pine - The standard wood type for this rustic log bookcase bed is rustic pine. This stunning wood is a consistent and fine grained woodworking material that has fewer knots and color variations than other similar rustic woods and is common in furniture building, especially for matching pieces in the same set like a bedroom or dining room set. 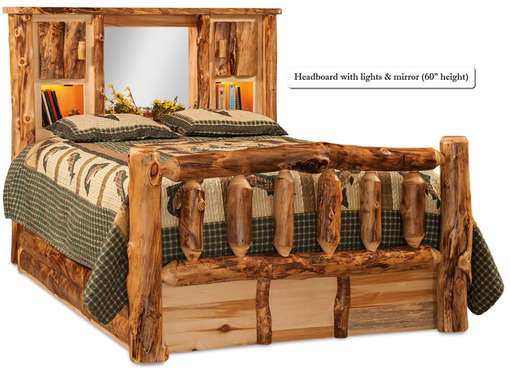 Design an entire rustic pine bedroom set to go along with your custom log bookcase bed. We have plenty of matching pieces to choose from, so you can find the perfect combination to match your personal style and home decor. Red Cedar - Red cedar is another unique and popular wood type that is known for its reddish hues and appealing woody scent that brings a fresh outdoorsy feel to the room. It is also a very strong, but light weight wood that can withstand substantial moisture and contains natural preservatives making it a natural deterrent of termites and decay. Your rustic red cedar log bed will last for decades without showing signs of aging with this resilient and beautiful wood. Aspen - A light colored and even grained wood with unique characteristics, aspen is one of our most popular wood types and a favorite for log furniture builders. 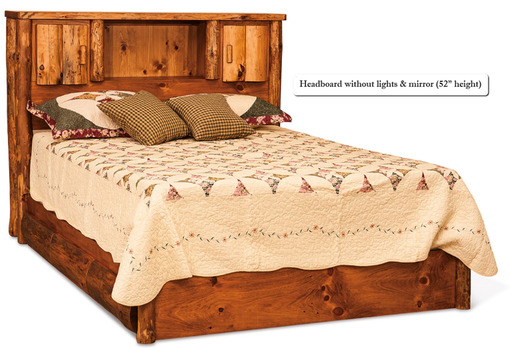 This durable wood type doesn't splinter as it wears and resists splitting from nailing and screwing, making it an ideal wood for heirloom quality furniture like this rustic bed, that will be enjoyed and passed down for generations. 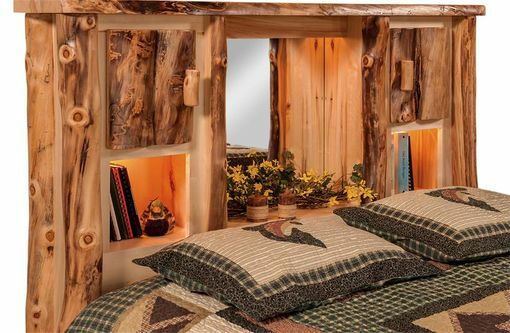 This is our most popular rustic log bed because of its unique look and functional design that allows you to keep all your night time essentials close by. The storage options of this beautifully crafted bed also provide our customers the opportunity to organize their bedroom in a small and compact space. This bed is perfect for smaller bedrooms or guest rooms and makes for a great conversation piece as the focal point of the room. Total Bed Length - 94"
Total Bed Length - 99"